The first thing to know about mast choice is how important it is! The mast is the backbone of your gear. All the forces from your sail, the vibrations from your board and all the effort that you put in, they all come together in the mast. A mast that doesn't match your sails and/or your own preferences will ruin your day. Trust us. Get it right first time and you’ll enjoy amazing, long-lasting value for money from your mast. And not have to worry about trading them for the latest model each year. Also, although we hope you gain insight from reading this, we recommend going to your local dealer for expert advice and service. Their input will be more complete than what we can offer in this basic guide. It’s considered good practice to follow the mast type and length recommendation of the sail manufacturer. The safe choice is to buy your mast and sails of the same brand, as they developed the sails around that mast. But many sail brands use similar mast specs, so mixing and matching across brands is sometimes a possibility. You may also consider buying an independent brand (yes, such as Unifiber!) which often works just as well. Our MAST SELECTOR will help you to make the right choice. The specs are based on the averages from all the brands we’ve measured over the past seasons. You can never record enough data and we’ve measured a lot of masts over the years! The result is a reliable tool that we and our customers have full confidence in. HOW MUCH CARBON DO YOU NEED? Price. Carbon fibre is an expensive material. The higher the carbon content, the more you have to pay for a mast. Weight. Higher carbon content means less weight. And if you have less weight to move around, that means your sail is easier to control. Response. The higher the carbon content the more responsive and direct your rig will feel. Durability. The downside of carbon fibre is that it is quite vulnerable on impact. So if you have a 100% mast, you should be extra careful not to drop it on the street or smash it on rocks. This will cause tiny cracks in the material that lead to weak points in your mast. Fundamentally, a mast is made from two material types: fibres that give the strength and stiffness, and the resin that keeps the fibres together. The most used resin is epoxy; and most manufacturers use a mix of carbon and glass fibres. The carbon content is defined as the ratio between carbon and glass fibres. The epoxy is not taken into account. So '100% carbon' means that the mast consists of only carbon fibre and epoxy, and contains no glass fibre. Assuming similar bend characteristics, sails will always perform better on higher carbon percentage models. But for durability - especially for wave windsurfers - 80% can be a good mix for durability and performance. The Bend Curve represents the shape of your mast under load. As we normally use conical-shaped masts (wider at bottom than top) when loaded the mast top bends a lot more than the bottom. So the Bend Curve describes the difference in deformation between the top and bottom part of your mast. Below image gives a (exaggerated) view of the difference between Flex Top, Constant Curve and Hard Top masts. A Flex Top (aka Soft Top) mast has a relatively stiff base and a flexible top. A Hard Top mast has a relatively flexible base and a stiff top. The total stiffness (IMCS value) for a given mast length is typically independent of flex type. The IMCS value indicates how much your mast bends under load. A lower IMCS indicates a more flexible, or 'softer' mast. Most mast manufacturers adhere to the more or less normalized stiffness for each mast length. E.g., 400 masts are often made at 19 IMCS, 430s at 21, 460s at 25 and 490s at 29. Hence longer masts are mostly stiffer than shorter masts. Unifiber also follows the above IMCS values per given mast length. Also, sometimes, mixing different bases and tops is possible, often with considerable influence on both the Bend Curve and IMCS. But this isn't necessarily possible on all brands, and is not intentionally possible or recommended with Unifiber masts. The result will be a 460 mast with the stiffness of the 430 mast. The stiffness characteristic will be closely match the 430 without extension, but slightly stiffer (approximately plus 1 on the IMCS). The Bend Curve will be as per the 430, but slightly more flex-top (around plus 0.5 on Bend Curve). Not enough theory for you? Well, read on and we’ll tell you how we test various sail brands’ masts with our own specially-built machine. The Unifiber mast selector, below, provides information on masts offered by sail brands. To enable easier comparison masts are categorized as Hard Top, Constant curve or Flex top. Unifiber masts give unbeatable value for money, performance and durability thanks to a consistent pre-preg manufacturing process, with stronger, integrated ferrules and a high-quality surface finish. 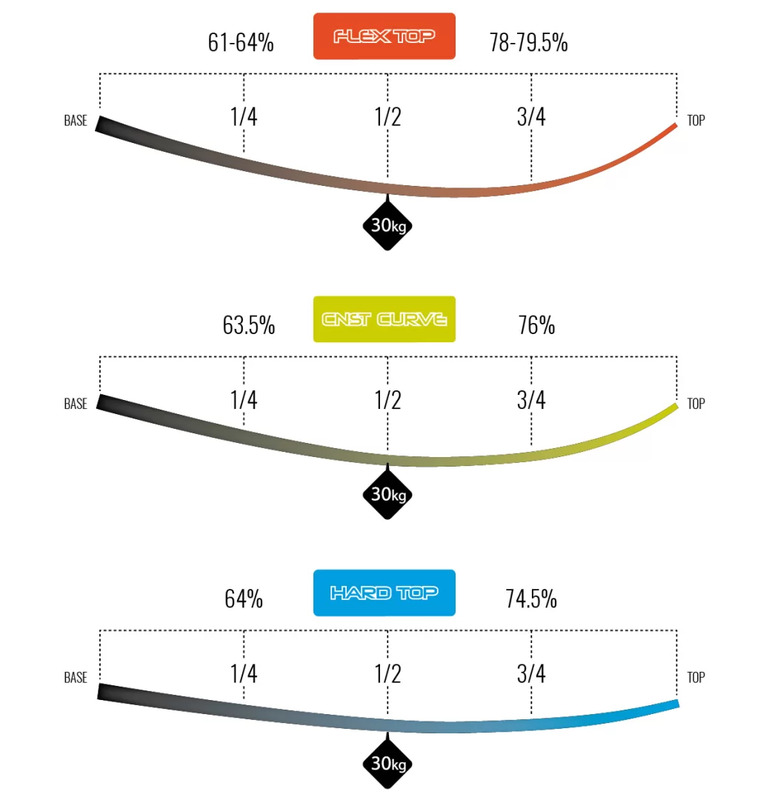 Unifiber offer 99 different choices of carbon content, diameter and 3 different bend curves to match almost any sail.